I went extremely overboard with making a self-contained script to close the themesection handle on winlogon.exe.. Both tasks calls different subroutines in the script in order to launch programs as needed (applicationframehost.exe, taskmgr.exe) before the themesection handle is closed by handle.exe. 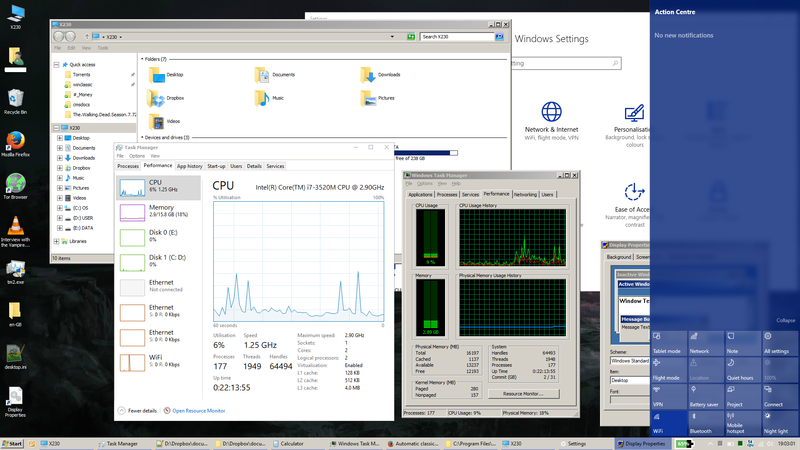 I also set open folder windows in a seperate process, so that the desktop and taskbar are working. All other folder windows and programs are in classic theme. You will notice it launches taskmgr.exe before closing the handle, then I also set the debugging key back to the nt task manager.. So I have replaced the new task manager with the old one, but also have the new one open and minimised to the system tray. Due to this, file explorer windows do not render. Do not use this script on 1809 if you need file explorer. and whats sofware need install firt? only your script is enough? Nothing else is needed at all - I have packed all required files into the batch script. Please try this in a vm first to see how it works. But saying that, you can always run the script again and select disable.. When you diable, our current theme is "Custom"
If you move the script file location, you need to run it again to update the scheduled tasks. thanks i plan mout .iso of windows 10 and auto run your script to transform in classic its possible run automatic with out user press anyting? 12 IF [%1] EQU  CHOICE /C ED /M "Enable or Disable Classic Theme? (E or D)"
Does this support languages other than English (I mean in task manager, calculator, etc)? What about other tweaks we discussed on this site (Client Edge, 32px icons, ListView control in Explorer etc)? What method do you recommend for client edge? AHK or dll? Also, for 32px icons - registry change + AHK, or pure AHK? For listview, Folder Options X utility looks like the best option to use (I don't mind resident program). only not work this, in your screen is ok this, on my not, do I need to mess with something? Hmmm.. on your first screenshot this looks like it's wokring - did you comment out line number 46? Can you look in System32 and see if you have UIRibbon.dll and/or UIRibbon.dll.old ? Thanks for posting your script! It seems to be working really well - it's nice that I can still launch Edge or other apps if I need to. Russian lang would be great. For Client Edge AHK is better. For 32px icons I use pure AHK method now. 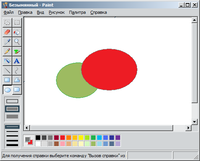 By the way, what about also adding Paint and WordPad from Vista? which causes paint to just error and close. I have also made the script much easier to control with a configuration section at the top. Hmm. On Win 8.1 paint from Vista works just well.